The theory of integral dynamics is based on the view that the development of individual leaders or entrepreneurs requires the simultaneous development of institutions and societies. It seeks a specific way forward for each society, fundamentally different from, but drawing on, its past. Nearly every natural science has been transformed from an analytically-based approach to a dynamic one: now it is time for society and culture to follow suit locally and globally. Each culture, discipline and person is incomplete and is in need of others in order to develop and evolve. 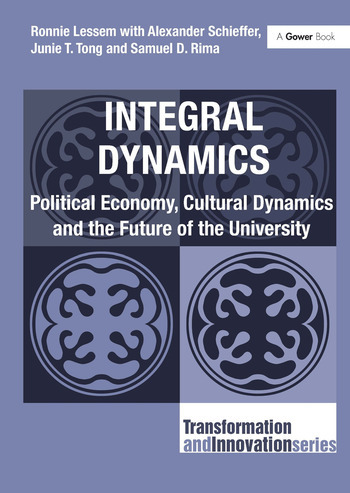 This book sets out a curriculum for a new integral, trans-cultural and trans-disciplinary area of study, inclusive of, but extending beyond, economics and enterprise. It embraces a trans-personal perspective, linking self with community, enterprise and society, and focusing on the vital relationship between local identity and global integrity. For the government policy maker, the enlightened business practitioner, and the student and researcher into economics and enterprise, the new discipline is set out here in complete detail by a multi-national team of Gower's Transformation and Innovation Series authors. Illuminated with examples relating the conceptual to the practical, this is a text, not for a pre-modern, modern, or even post-modern era, but for what has been called our trans-modern age. Ronnie Lessem is a co-founder of Trans4m (Geneva), which offers programmes on social and economic transformation and Innovation, in partnership with universities and consultancies. He is also a senior faculty member of Da Vinci Institute in South Africa. His academic career has embraced what is now the University of Zimbabwe, the LSE, and Harvard. Dr Alexander Schieffer gained a Doctorate in Leadership at the University of St Gallen. He is co-editor of the Gower Transformation and Innovation Series with Dr Ronnie Lessem. He is also co-founder of the Geneva-based Trans4m Institute for Integral Innovation. Dr Junie T. Tong is Senior Lecturer in Business Economics at Staffordshire University. She is an ex investment banker and Associate Director of Swiss Bank Corporation International. She spent many years overseas and specialises in interdisciplinary research. Dr Samuel D. Rima is of Native American heritage. Dr Rima has worked in national politics and the Church, and serves as faculty at Bethel Seminary in Minnesota and is the co-founder of the Movement for the Advancement of Spiritual Capital.